Considered as a major commercial and industrial area in Melbourne, Dandenong is a colourful multicultural city that’s now booming with commercial establishments and attractions. Because of this, Dandenong makes a great place to start a small business today. If you are looking for strategic sites to start your claw machine franchise in areas around Dandenong, Springvale, Hallam, Narre Warren, Rowville, Lynbrook, Endeavour Hills, and Mulgrave, read on for some excellent suggestions! If you’re looking for a crowd, the Dandenong Plaza is easily an obvious choice. The shopping hub houses an extensive array of shops—not to mention it is situated right at the heart of Dandenong—so it is basically where people a.k.a. potential players flock! For weary shoppers, finding a claw machine in the corner can be a sure relief, especially if they are tagging their kids along! The Lunar Drive-In is a favourite among its following because of its true retro ambiance, where customers can watch films with the comfort of their vehicles in a refreshing outdoor setting. Fast food and drinks are also served! Although unconventional, the site is an interesting choice for your business for sale Dandenong. People always love a good recreation experience, which is why a sports and recreation facility such as AMF Bowling is always packed. 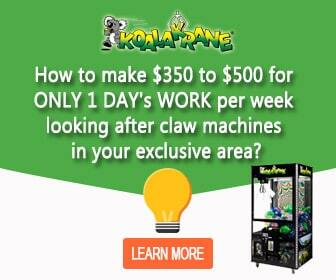 Take advantage of this by placing one or two of your claw machines in this site. Your toy crane machine can be a good pastime while players are waiting for their turn to bowl. There are still loads of potential locations around Dandenong where you can kickstart your small business. If you are interested in getting a claw machine franchise, reach out to us now! See other franchise locations: surrounding Lake Entrance area, within Traralgon area, around Dandenong area and Moe.